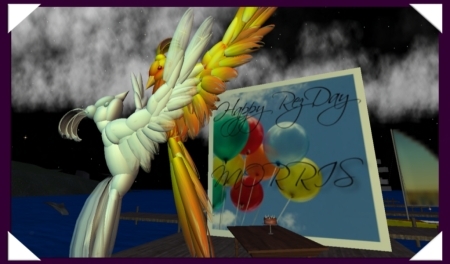 The photo is from my impromptu rez day party, quickly organized by Tayzia Abattoir and Isolde Flamand…Tayzia rezzed what I think is one of the most incredible pieces of SL sculpture art, I believe it’s called “Fire and Ice,” on the pier. And the giant card and cake were from Isolde. Thanks to everyone who came out and partied on the pier! No better way to spend my first rez day!